We take a break from binging on Shadow Raiders to pop in the new Blu-Ray of Willow. It's kind of funny.... Everyone remembers the first movie they saw, but do you remember the first movie trailer you saw? 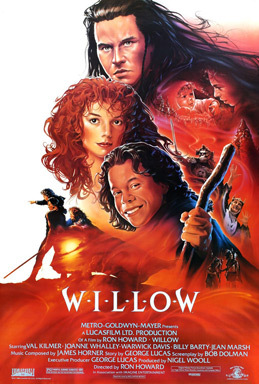 The first trailer I remember seeing was for Willow. Man o man, that voice over at the end going, "From the creator of Star Wars, and the director of Cocoon," haunted me for a while. I can't remember what film I saw it in front of, though. I'm trying to remember...since it came out in May of 1988, it could have been anything in theatres between Christmas of 1987, and the spring of 1988. But that's the first trailer I remember seeing in the theatre. It's funny how Willow has been experiencing a bit of a resurgence in recent years. It all came about when Disney bought Lucasfilm back in 2013. People started going, "OK, with Lucasfilm, Disney gets Star Wars, Indiana Jones, and...anything else?" And people started saying, "Well, there's Willow." After his successes with Star Wars and Indiana Jones, George Lucas set out to create a fantasy franchise. The urban legend always was that Lucas wanted to do an adaptation of Lord of the Rings, but when he couldn't get his hands on the movie rights, he decided to do something Lords of the Rings-ish. Lucas's official story was that it was an idea he'd been kicking around since the early 1970s, and, impressed with young Warwick Davis's performance as Wicket in Return of the Jedi, decided to dust it off as a vehicle for Davis. And by the mid-80s, special effects technology had advanced to the point where he could finally make it. At this point in his career, Lucas had given up on directing, and settled into the role of writer and producer. To direct Willow, he called upon his old buddy and American Graffiti star Ron Howard. I've heard Howard both complimented and criticized from being a director with no distinct style. He's able to adapt to whatever kind of film he's directing. And that is very evident in Willow. It's a Ron Howard film, but Lucas's fingerprints are all over it. Hell, we even use the trademark Star Wars wipes for scene changes. Many have pointed out that the plot is shocking similar to A New Hope. A friend of mine summed it up quite rightly a few years ago when she described it as, "If Star Wars and Lord of the Rings had a baby." I do remember watching it on VHS a few times when I was a kid, but it made no lasting impression. Kept falling asleep in the middle of it. My clearest memory (besides the teaser) is the unsold action figures gathering dust on the toy shelf in the Evansburg Home Hardware when I was a kid. But still, brand new super-special edition Blu-Ray coupled with Christmas gift cards makes one go, "What the hell?" There is a prophecy that a child will be born with the power to overthrow the evil sorceress Queen Bavmorda. So Bavmorda has all the pregnant women of the realm rounded up, with the idea of capturing the child as soon as its born, and banishing it to another realm where it will never be a threat to her reign. When the child is born -- a baby girl -- the midwife takes pity on the mother and smuggles the baby out of the castle. When Bavmorda's troops catch up with the midwife, she places the baby on a raft and sends her down the river. The baby washes ashore on the farm of Willow Ufgood, played by Warwick Davis. Willow is a humble Nelwyn farmer and family man, but he dreams of being a great sorcerer someday. Willow's family takes in the baby, knowing that taking in a Daikini child could lead to trouble (Oh, the two main races we meet in the film. Daikini = humans, Nelwyn = hobbits) The town festival is coming up, and Willow hopes to be taken on as the apprentice of the town's sorcerer. Willow doesn't pass the test, and Bavmorda's hellhounds show up and raze the town. Realizing that the hounds were looking for a baby, Willow confesses that he found and has been harbouring a Daikini youngling. So, Willow and a fellowship of Nelwyn set out to return the baby to the Daikini. As they set out, the town sorcerer tells Willow how he blew the test to become his apprentice. Willow has the potential, but lacks the confidence. Our fellowship arrives at the Daikini crossroads, and finds a prisoner locked in a cage, waiting to die. He is Han Solo Madmartigan, who professes to be the greatest pilot swordsman who ever lived. After waiting a few days at the crossroads and being rebuffed by several Daikini, Willow agrees to release Madmartigan on the promise that he look after the child. Madmartigan and the baby set off, Willow returns home. The end. Nope! The baby is almost immediately kidnapped by brownies, who, in turn, abduct Willow. The brownies take the baby and Willow to the queen of fairies, and she lets them know the situation. The baby is Princess Elora, who will grow up to overthrow Bavmorda and rule the land in peace. Elora has selected Willow to be her protector. Willow must take the Death Star plans Elora to Obi-Wan Kenobi the sorceress Fin Raziel, and together, go to the Alderaan Tir Asleen where Elora can be raised in safety. So Willow and Elora and two brownies for comic relief set out to find Fin Raziel. They stop in a Daikini town for supplies, where they run into Madmartigan who reluctantly joins them. This is also their first encounter with Bavmorda's daughter Leia Sorsha and Bavmorda's general Darth Vader General Kael, who wears a mask made from the skull of some forgotten beast. Our heroes escape, but for Madmartigan and Sorsha, it's love at first sight. Willow, Elora, and Madmartigan make it to the lake where Fin Raziel was banished, and there's a new wrinkle. Raziel was also transformed into a possum by Bavmorda, and Willow needs to learn the ways of the Force magic in order to restore Raziel to human form, and thus, full power. Our party is captured by Sorsha and Kael, but they manage to escape. But first, Madmartigan, under the effects of a brownie love potion, spews love poetry at Sorsha, which intrigues her. Our heroes escape again, and it almost seems lost as they're cornered in a village, but they escape once again by taking Sorsha hostage. Along the way to Tir Asleen, they get to talking, but Sorscha still escapes and goes back to Bavmorda's forces. They get to Tir Asleen to find Bavmorda's gotten there first, and the rebel forces are encased in crystal. Our heroes decide to make a stand. This is the part of the film that I always remember. The castle is overrun by trolls, so Willow has to deal with them. Attempting a transformation spell, Willow inadvertently turns one of the trolls into a 2-headed dragon. As the troll transforms, it turns into this writhing lump of flesh that two embryonic heads sprout from. It's all rather disgusting, but the resultant 2-headed dragon is some spectacular stop-motion animation from legendary stop-motion animator Phil Tippet. And this is where Sorsha officially turns to the side of good as she gets all hot and bothered at Madmartigan's sword-slinging. I guess my biggest problem watching it again tonight was I wish she had more of a character arc. It comes across as, "My mother is mean to me, but here's a dude who's nice to me and makes my woman parts tingle. I'm with him now." It's funny...watching the deleted scenes, there actually was a whole subplot about Sorsha searching for her father that wound up getting cut. We learn that Sorsha's father is the king of Tir Asleen, and upon seeing Sorsha during the battle, is able to find the strength to utter, "Daughter...help...me," from his crystal prison. So it wasn't just getting hot and bothered for Madmartigan that made her switch to the side of good, but also seeing the extent of her mother's cruelty. Anyways. The battle is lost as Kael makes off with Elora. Willow, Madmartigan, and Sorsha reunite with some soldier friends of Madmartigan's, and they take the battle to Bavmorda's castle to rescue Elora. Bavmorda scoffs at their encampment and turns the army into pigs...except for Willow and Raziel, as Raziel had Willow cast a protection spell over the two of them. Raziel says there's no more time for dickin' around, Willow must return her to human form. (Willow tried twice earlier in the film, first turning her into a raven, then into a goat.) Willow unleashes the transformation spell once again, turning her into a menagerie of animals before finally getting her to her human form. (Fun trivia fact: George Lucas's special effects company ILM invented morphing to pull this off.) This does result in one of the lines from the film that always stuck with me. Earlier, Raziel had told our heroes that her human form was, "a young, beautiful woman," but when she's returned to human form, she's old and...differently beautiful. She looks at her old body and says, "Was it really so long?" Anyways, with Raziel back in human form, she turns the army back into human form and puts a protection spell on them so Bavmorda can't do it again. (And I should also mention, when Bavmorda turned them to pigs, there were some wonderfully gruesome make-up effects showing people mid-transformation.) Willow comes up with a plan to hide the forces, and then they trick the villains into opening the front door when Willow calls them out. With the front door open, our heroes storm the castle. Madmartigan and Kael have their epic sword fight, and Raziel, Sorsha, and Willow go off to confront Bavmorda and save Elora. Bavmorda takes care of Sorsha, Raziel and Bavmorda engage in a wizard's duel, and Willow tries to make it through the crossfire to save Elora. Bavmorda gets the upper hand. I should have mentioned earlier that, in addition to wanting to be a wizard, Willow has also taught himself some tricks of sleight-of-hand to entertain people. Confronting Bavmorda, he tells Bavmorda that he'll send Elora to a realm where Bavmorda will never find her. Willow makes Elora disappear. Bavmorda is baffled by this, the spell she was casting to banish Elora to a realm of darkness backfires, and Bavmorda winds up banished to the realm, and Willow reveals to our heroes that he didn't really make Elora disappear...it was one of his feats of slight-of-hand. The battle is won, Tir Asleen is restored, and Madmartigan and Sorsha settle down there to raise Elora. Willow returns home with a gift from Raziel...a magic book, from which Willow can study and continue his journey to being a sorcerer. The end. And that was Willow. It was a fun film, but, couldn't help but shake the feeling that you'd seen it all before. The special effects were cutting edge for 1988, but some of them haven't aged well, particularly the green screen effects used to put the tiny brownies into scenes with full-sized people. But yeah. It was nice. I'm not encouraged, though, to read the rest of the story. It never turned into the franchise that Lucas had hoped, so what he did was he took his outline for the franchise and gave it to comic book legend Chris Claremont. Claremont turned into a trilogy of novels, published in the mid-90s under the title Chronicles of the Shadow War. Our protagonist is Elora, now a teenager, and setting out on her own hero's journey to realize her destiny. Ya never know if Lucasfilm will choose to reboot this property. Everyone's looking for the next Game of Thrones, so maybe a Willow series can be the fantasy epic on the Disney streaming service.